A historical retrospect shows, that already mid of the 18.century vertical basket design of centrifuges were standard. At that time sugar massecuites from sugar beet production was centrifuged on a large-scale. Also chemical products would be processed with such centrifuges. With an increasing industrialization a variety of centrifuge versions with vertical positioned baskets came into the market. So among others star buffer centrifuges, one-buffer centrifuges, free-running centrifuges, pendulum suspended centrifuges as well as three column centrifuges are known. Finally the last-named have been established in the 20.century. This is to be explained with the possibility of a realisable gas-tight centrifuge construction without great effort. In all fairness it has to be mentioned that the pendulum design could stand it’s ground for the processing of sugar and dextrose massecuite up to today. The 3-column-design had been launched with a variety of different rotor types. So as classic top discharge centrifuge (Krettek-Bild 226) but also with loosening scrapers or also in construction with detachable top of basket with below hanging filter bag (Krettek picture 259) used world-wide. 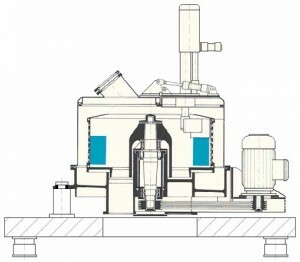 This machine design was substituted by the so-called vertical peeler centrifuge in the eighties and nineties of the last millennium. Here the rough design framework remains unchanged beside the real pendulum suspension. This machine type (Krettek picture 228) have been made fit for the next millennium by bolting beneath resp. welding of a vibration plate with below installed vibration dampers. This at least was the opinion of many world-famous centrifuge manufacturers. The horizontal basket position was marketable beginning of the 20.century, characterized by very solid centrifuge designs, which rigidly mounted were based on heavy concrete foundations with a substructure in deep natural ground. In the course of the century the continuous development implicates to assemble these centrifuges on separate based and vibration-absorbed installed massive vibration blocks. Due to this the planning for a new building or rebuilding of a production plant was essentially more complicated resp. more extensive than for the planning of three column centrifuges, which do not need a separate, heavy vibration basement. 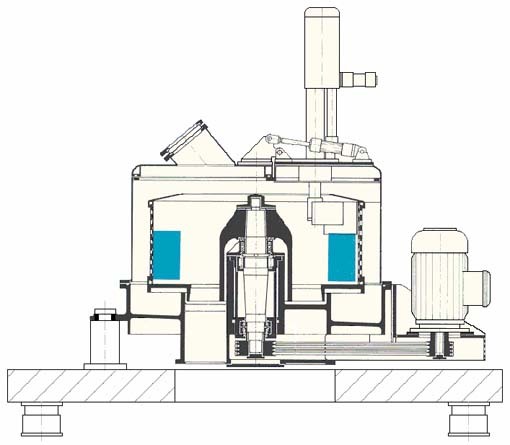 For the modern plant design this cannot be used as a real criterion, because innovative horizontal peeler centrifuge designs safely compensate to a great extend the possible occurred unbalances in combination with the vibration table and the underneath installed vibration dampers. 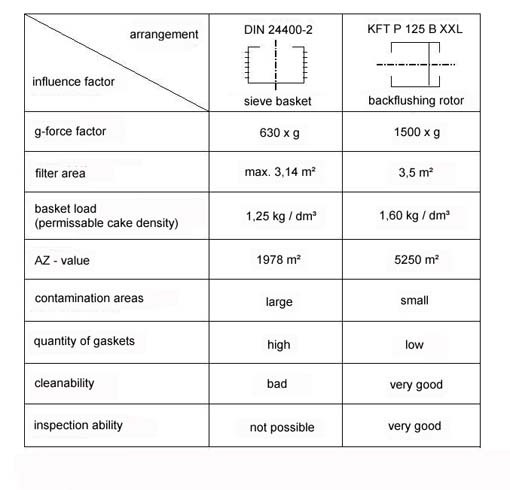 Another important decision criterion is the available g-force factor, which is defined depending on the basket diameter and the speed. In the context of a standardization peripheral speeds of 63 m/s at the basket shell according to DIN24400 were predefined for three column centrifuges in Germany. For horizontal peeler centrifuges this almost universally valid value is 80 m/s. The main part of world wide centrifuge manufacturer orient themselves towards this value. We believe and we have demonstrated this again and again in production scale, that for the process of fine resp. ultra-fine materials essentially higher g-force-factors and therefore necessarily higher peripheral speed are much more useful, if not in many cases absolutely indispensable for a trouble free and low-staff production. Therefore Krettek horizontal peeler centrifuges are designed for a peripheral speed of approx. 100 – 110 m/s, depending on rotor diameter. So the realized g-force factors of the horizontal peeler centrifuges of Krettek are normally approx. 50 % higher than these of the competitors. 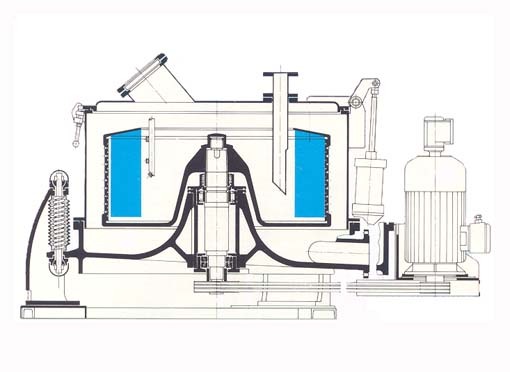 Referred to vertical peeler centrifuges with a peripheral speed according to DIN 24400-2 more than twice as high, always with regard to comparable rotor diameter. 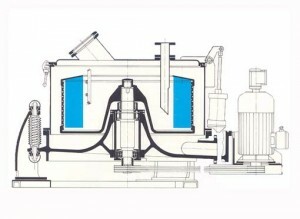 Following a comparison of horizontal and vertical rotor position using the example of the Krettek horizontal peeler centrifuge series type ProCent and the vertical peeler centrifuge according to DIN 24400-2, referring to a comparing roto diameter of 1.250 mm.